There's this myth that the alternative food movement is for one kind of person: white, and wealthy. In reality, the alternative food movement is incredibly diverse. You don't have to consider what you are doing "food justice" or identify as an "activist" to be a vital part of the push to nurture local economies, cultivate resilient ecosystems, and create the fertile soil for food systems change. This doesn't mean that creating a system of sustainable agriculture that values the lives of farmworkers and honors the intricacies of our interconnecting ecosystems is purely about making the switch to organic. (For more, read this article by Jason Allen and Andrew Smolski in Jacobin about realizing agroecology's liberatory potential). But consumer choice and collective action can—and must—exist in tandem. I'm lucky that I've been able to work with backyard gardeners, urban farmers, radical beekeepers, and waste-free chefs whose passion is proof that there are as many ways to build a sustainable food system as there are worms in the soil. Our shared experiences remind me that I really can vote for the world that I want with my hard-earned cash. It takes some perspective shifts, planning, and a little practice, but eating your values is well within reach. Even if you don't live near a farmers' market or have ready access to a local co-op, there are many different tweaks you can make this very day to bring your own "spirituality diet" into being. Below is a breakdown of how I eat in greater alignment with my values. Consider it a blueprint for creating your own model for eco-friendly eating. I spend less than $60.00 a week on food by buying "seconds" at the farmers' market, cooking closed-loop, and snagging my grains, nuts, oils, and spices in bulk (thanks to my friends for tending to a sweet community garden plot that has given my house an abundance of free dried herbs). Take in mind that I shop only for myself and very rarely eat meat, eggs, or dairy. And remember too, that what I'm doing is by no means the perfect or the only way to eat your values. Everyone's values are different and slippages between the world that we are working toward and the world that we live in are inevitable. Some days, I am so with it on soaking my own beans and buying package-free and making enough homemade granola to share with friends, and other days, I just tuck myself into bed with Tsel Mo-Mo from my favorite Tibetan joint and drink chocolate milk straight from the bottle. The following is a list of what I used in the kitchen this past week. I bought all that green goodness for just $16.00 from my neighborhood farmers' market as well as replenished my supplies of corn meal, quinoa, pasta, and dried black beans for $16.00 from my grocery's epic bulk section. I also snagged a couple cloth bags of dates and nuts to make my own chai-spice breakfast bars for $10.00. Many of my pantry staples were leftover from the last few weeks and so I grabbed bulk teas for $10.00 and almond milk for $4.00. $56.00 for more than twelve meals at home? That's pretty sweet. Good food isn't—and shouldn't be— dirt cheap. We are so acclimated to the artificially low prices at supermarkets that few of us know what the real cost of food is. I don't want what I'm eating to accelerate climate change or contribute to the systemic abuse of farm workers. And so I make compromises elsewhere in my budget to prioritize food that embodies my belief in a better world. Some of the most costly items at the grocery store—meat, dairy, eggs—are also those that you don't need to eat every single day to be healthy. Of course, everyone has different bodies and dietary needs. You might thrive better sipping on bone broth every few weeks or scrambling eggs for breakfast each morning. So figure out what your priorities are and invest. One of my friends, for example, buys her meat only from the farmers' market and cooks up a steak a once a month. Another one of my friends sources her eggs from a local homestead so she knows just how her hens are treated. Packaging is pricey! One of the best byproducts of my journey toward trash-light living is that I have saved so much money by making my own cereal, bread, granola, and crackers rather than buying their packaged counterpoints. Having chips from a bag or chocolate in a wrapper is a real treat right now in my life! Eating well and on a budget isn't always super easy. But so what? 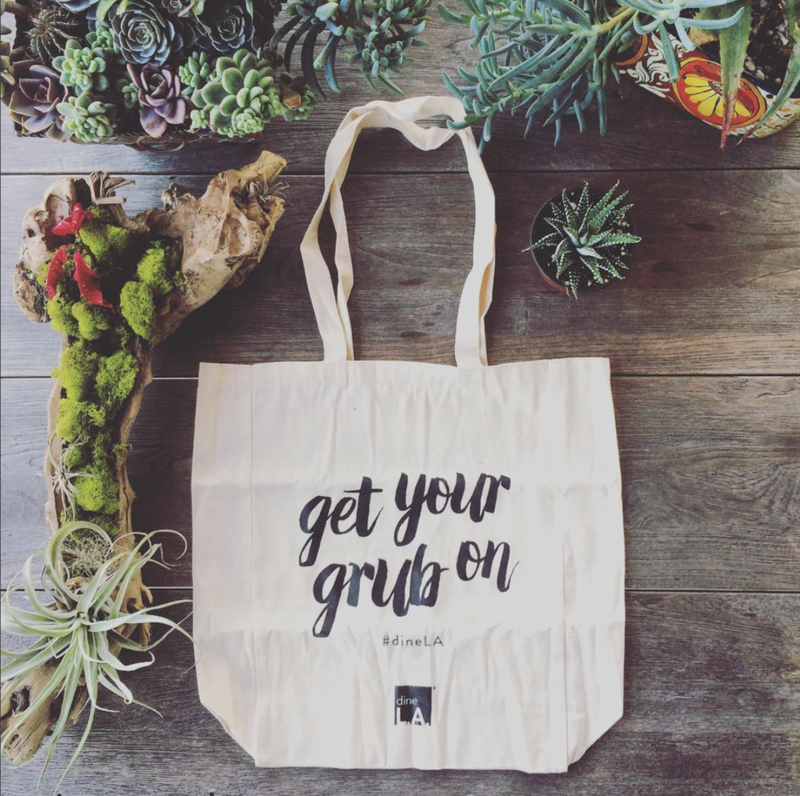 Putting in the extra time to support what you believe in is worth the minor "inconvenience" of planning your meals in advance or remembering to stock your work bag with reusable totes for on-the-fly grocery shopping. Caring is cool. You can make the time to cook food. On slow-moving Sunday evenings, I cook up a lot of my grains for the week as well as prep super simple date-walnut bars (my homemade version of LARA Bars) to eat for breakfast. I put on music that I like and sip on chai tea to make this chore a delicious act of self-care. I'm fortunate to have access to an affordable farmers' market six months out of the year. But not everyone lives close to local food. If you're searching for a way to shop sustainably, try reaching out to a grocer to learn about what company supplies their organic fruit & veg. You might be able to buy in bulk from their supplier. Build a community wherever you live of environmentally-conscious eaters and you will multiply the opportunities to find—and to generate—creative solutions. Share food with friends! Sharing is not only one of the simplest ways to save money, but it is also the best tool that I know for generating abundance & joy & generosity in your life. Plan a few meals with friends each week and work out what you'll bring in advance. This past week, I had tacos with a friend (she gifted corn tortillas and local eggs; I brought farm-fresh veggies), roasted pumpkin, peanut noodles with fried tofu, squash-lentil soup, and chili. On my own, these wholesome meals wouldn't have been possible. With friends, we were able to make delicious use of whatever was in our kitchens. Make your own! It's worth repeating because it's true: you'll save money and nurture your cooking skills by making your own breads, granolas, spice mixes, and sauces. This recipe for damn good granola is a simple starting point. 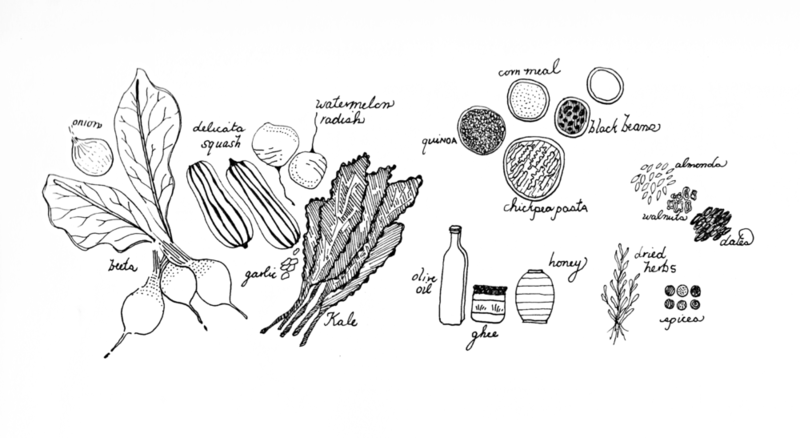 Closed-loop cooking is key to eating well on a budget. You can sauté beet greens as you would any other green and a stalk of Brussels sprouts has three lives to give: roast the Brussels sprouts, puree the stalks to make a pesto, and sauté the leaves. And whatever you can't possibly use (outer onion skins, eggshells), compost. Start small. Overhauling your entire system for buying and cooking food can feel overwhelming. So take little steps and make it fun. Maybe challenge yourself to shop seasonally for just one week (no better time to try it out than the harvest season!) Decide to swap meat from the supermarket for meat from the farmers' market or make the choice to only buy eggs when you can do so from a local vendor. Or you can choose to make one thing, such as cereal or bread, that you buy packaged most of the time. Find something that's meaningful to you and play with it! We always have the opportunity to live a life that is in closer alignment with our values. We might not inhabit worlds that make doing so easy, but we do have the resources, creativity, and community support to build those worlds. And remember that the Loam crew is here for ya! We want to inspire every one of our readers to embody hope so feel free to write to us at connect@loammagazine.com with questions, follow us on Instagram for strategies for sustainable living, and/or share your tools for eco-friendly eating in the comments.